Boats: Autopilots - The first self-steering gear was introduced in the 1920's to control model yachts but it was not until 1948 that the principle was applied to full scale yachts. Standing at the helm for lengthy periods, monitoring instruments and keeping a good look out can be very tiring. 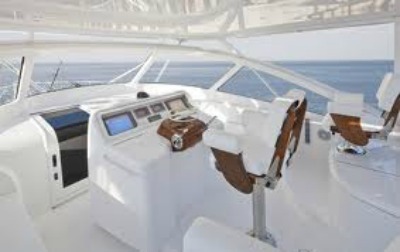 An autopilot relieves the helmsman from steering the correct course leaving him free to maintain a proper watch. The autopilot can be set to either steer a compass course or a course relative to the wind. A fluxgate compass or electronic wind indicator feeds information to a microprocessor which then makes the necessary rudder movements to return the vessel to it's required course. The mechanical power is applied to the rudder by either electric linear activators, hydraulic pumps or rotary drives. GPS/Chart plotters can be used to input navigational instructions to the autopilot. Chart Plotters Typically a chart plotter consists of an antenna, mounted high on the boat, to track GPS signals and a display unit sited either at the at the navigation station or the helm of the vessel. The vessels position is sent from the antenna to the display unit which in turn shows it graphically on the chart. The Chart itself will look similar to it's paper equivalent and show depth, land mass, navigational aids such as bouys and potential dangers in the form of wrecks and obstructions. The user can add way points to the chart and zoom in and out of the display. 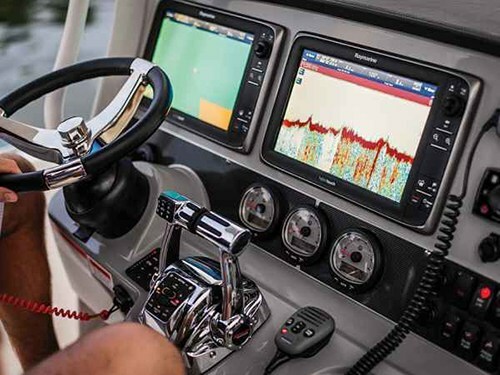 Chart plotters can be connected to drive an autopilot and/or send GPS data to a fish finder or radar. They can also interface with a laptop enabling complex passage planning to be done away from the boat and then entered into the chart plotter after arriving at the boat. Magnetic Transmitting Compasses work like traditional compasses using magnets to determine the vessels orientation to the earth's magnetic field, they then transmit the boats heading to an electronic display. They make steering easier than with conventional compasses because they display steadier headings and do not suffer from the "lag" that occurs when making a turn. 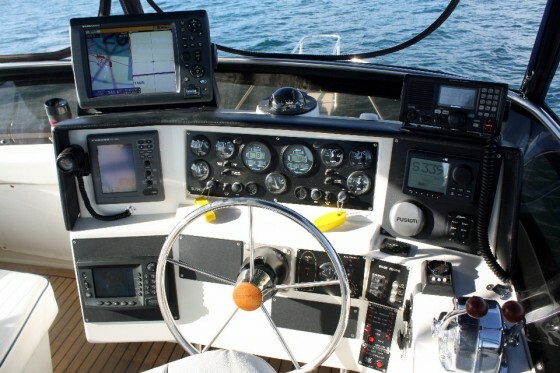 They can interface with chart plotters, autopilots and radar. Fluxgate Compasses consist of two pieces of readily saturated magnetic material with coils wound round them in opposing directions. AC current is passed through the coils and the material is saturated in one direction and then the other. The earth's magnetic field affects slightly the time at which saturation occurs, earlier in one coil and later in the other. The difference is then calculated giving an output proportional to the earth's magnetic field. They are accurate to 0.1 of a degree. Their output can be displayed digitally to the helmsman or they can interface with autopilots, chart plotters and radar. Echo Sounders work on the same principle as sonar. A transducer emits a narrow beam of high frequency sound. This is reflected by any solid objects and the time between transmission and receipt of the echo is measured. The speed of sound through water is known and so the range or distance to the sea bed can be calculated. That is then displayed in metres. Forward Looking Sonar (FLS) enables you to see the underwater hazards before you're actually on top of them. A typical range for a FLS is 150 metres. An Emergency Position Indicating Radio Beacon (EPIRB) is a piece of equipment designed to float free of a vessel in distress. It then sends a radio signal that can be detected by Search and Rescue Satellite Aided Tracking (SARSAT) satellites. They relay a message to a ground station that in turn can instigate a search and rescue operation. Fish Finders use the same technology as sonar. A narrow beam of high frequency sound is transmitted by a transducer, this is reflected by solid objects such as the sea bed. This system was originally designed for military purposes and is owned and operated by the United States Department of Defense. 24 satellites are arranged in a "birdcage" around the globe, they are positioned in such a way that at any place on the earth's surface a direct line of sight can be established to a minimum of 4 satellites. A fix is obtained by measuring accurately the distance between a satellite and the GPS receiver at a precise time. Because the exact position of the satellite is known, these distances provide position lines which are converted by a microprocessor within the GPS receiver to read outs of latitude and longitude. The log is used to measure the boats speed through the water. A paddle wheel or impeller, mounted below the waterline is turned by the flow of water, this generates electrical impulses that are fed to a microprocessor that displays both speed and distance run. Inverters - On most boats today, you will find domestic equipment of one sort or another. For on board entertainment there are televisions, and stereo systems. With the popularity of chart plotters comes the PC or laptop. Maintenance often requires the use of power tools. Liveaboards might have a washing machine, dishwasher or microwave. Can take 12v, 24v or 48v supply and convert it to a stable 110 v or 220v AC supply. Navtex can perhaps best be described as a continuously updated telex service providing navigation and weather information within specified areas. An on board receiver, tuned to 518kHz, the worldwide Navtex frequency, if left turned on will either print out or display the latest massages sent from a local station. The service is available up to 400 miles from the coast. Radar enables you to see what otherwise would be invisible. They offer greatest benefit at night and in fog or rain and are of particular value when close to shore or in busy shipping lanes. They consist of an antenna and a display. The antenna sends out a stream of RF energy which is reflected back off hard objects. When this energy is bounced back it is converted to a signal which is displayed to the user. The antenna rotates every few seconds, the display continuously calculates the direction of the antenna and so a precise bearing to the target is calculated. The time is measured for the energy to be reflected and so the distance of the target is also displayed. Satellite Phones consist of an antenna, a modem and a normal handset. They are powered by an iridium battery. Their range anywhere is covered by in Inmarsat Mini-M satellite. Voice, fax, email and data can be transmitted. Satellite TV requires an antenna and of course a television. Reception is available within a "footprint" which is based on EIRP (Effective Isotropic Radiated Power) of a transmitting satellite. The EUTELSAT together with the two ASTRA satellites cover Europe. NILESAT and the two ARABSATs cover Africa and the Middle East. Good coverage is also available in North, Central and Southern America. SSB Radio has a range of several thousand miles. You will need an FFC license, or the equivalent in whichever country you plan to operate it. Power consumption is a consideration. Up to 100 Watts may be required for transmission. SSB radio requires several items of equipment. A transceiver capable of SSB operation, An antenna, this must be 8 meters long and in practice most boats use a back stay or shroud for the purpose having fitted the necessary insulators. An antenna tuner matched to the transceiver model. If you want to send email you will also need and radio modem and computer. VHF Radio - The power required to transmit is minimal, all sets have the option of transmitting on either 1 Watt or 25 Watts and the lower power should be used whenever possible. Unlike telephones that allow you to both talk and hear at the same time most VHF sets require you to press a transmit button prior to talking. This is known as simplex. Duplex sets are available but are much more expensive. VHF radio waves travel in straight lines so the aerial should be mounted as high as possible, preferably at the masthead.